Cue the confetti cannons and all the silliness possible for this little blog intro! Anyway, I’m excited to be making my way back into the blogging world after a few months’ break this summer. I took the summer off, so I could focus on living the stories fully before telling them. I needed to make space for growth, space to really see all the shapes and colors of this season of my life. I needed to appreciate where I was before I could get excited about where I’m heading next. This summer has been SO FULL — packed to the brim with adventuring, sunscreen-smeared books, and summer celebrations of all sorts. It’s been full of abiding, and it’s been full of discovering. I think it’s just what I needed. God’s been doing some necessary work on my heart, too, growing me in new, important ways, stretching and redefining my trust in Him. I’m grateful for that. It smells and feels like fall today, and maybe, because of that, it’s the perfect day for me to be writing this post, acknowledging that although summer is coming to a close, there are new days and new adventures ahead. In the meantime, I’m excited to soak up every last bit of summer — and to start telling some stories. P.S. The image in this post is the cover of an Instagram album I’m in the process of making. 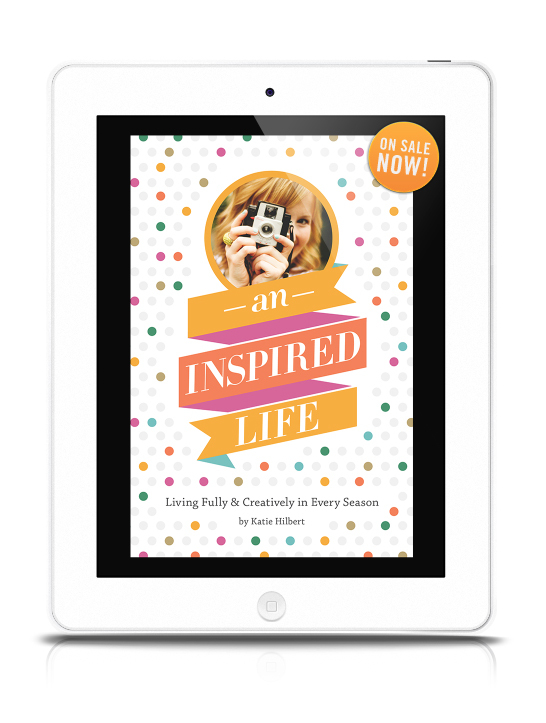 I wanted to make something tangible that celebrated my inspired life and all God’s been doing and teaching. I’m excited to share more about that sometime soon. But my latest oatmeal creation is a pretty good incentive for pushing back those blankets and beginning your day with fresh hope and joy. There’s also something comforting about beginning a day with something slow and ritualistic like heating milk on the stove, stirring in the oats, and contemplating the day that stretches out before you. This hearty bowl of oats combines the flavors of cranberry, orange, walnuts, and semi-sweet chocolate. It reminds me of a cookie, muffin, or scone — but feels healthy! Lightly sweet, while also being hearty and filling — it’s definitely my new favorite way to start the day. Cook your oats, according to the directions on the package. Once they’re ready, add your toppings, stir, (let cool a bit), and enjoy! Even though our temps are in the fifties and sixties this week (yay! for a little unexpected warmth! ), it’s beginning to look a lot like Christmas. And I can’t help but grin when I pass cars journeying home with Christmas trees strapped to their roofs, or when I spot a house all lit up with twinkly lights. I have mint chocolate chips waiting in my pantry for a special hot cocoa recipe, tinsel on my shopping list, and a growing Spotify playlist. And while I have plenty of Advent posts I’d like to write, things on my heart, reflections I’d love to share with you all, tonight’s post is on the lighter — and sparklier — side. Because while I am spending my days preparing my heart for Christmas day, I’m also delighting in the present moments of the season — being right in the thick of it, as Jessi would say. Because these days are such a gift, aren’t they? 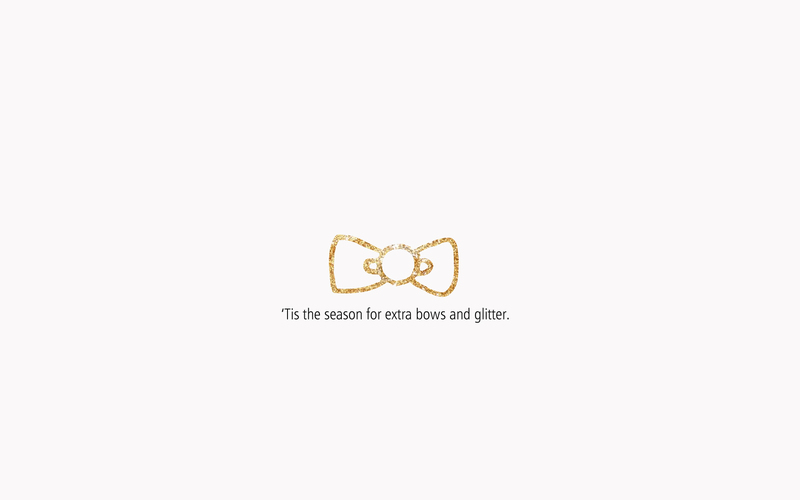 And speaking of December days, have you seen this festively fun 31 Things to Do Before December 31 list from Kate Spade? 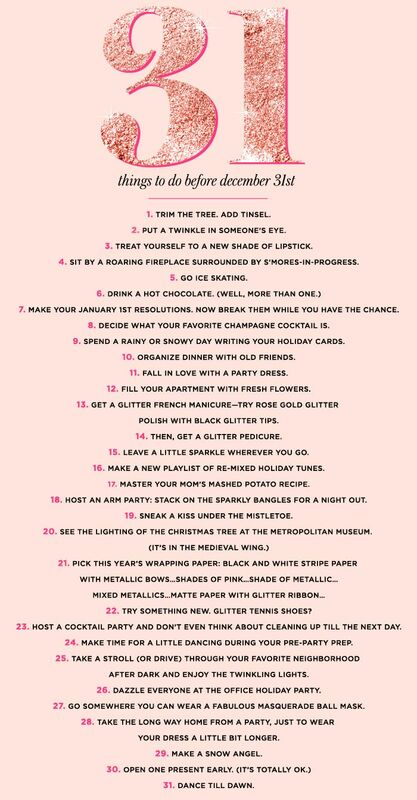 I just love these suggestions for making the most of your December moments. P.S. Just for fun, I created this little desktop wallpaper to celebrate the season’s sparkle. I was blessed to spend Saturday celebrating with friends and family at an early 30th birthday party. It was quite the event! ;) We enjoyed lots of good food and plenty of delicious desserts (including a raspberry-filled cake with polka-dot candles! 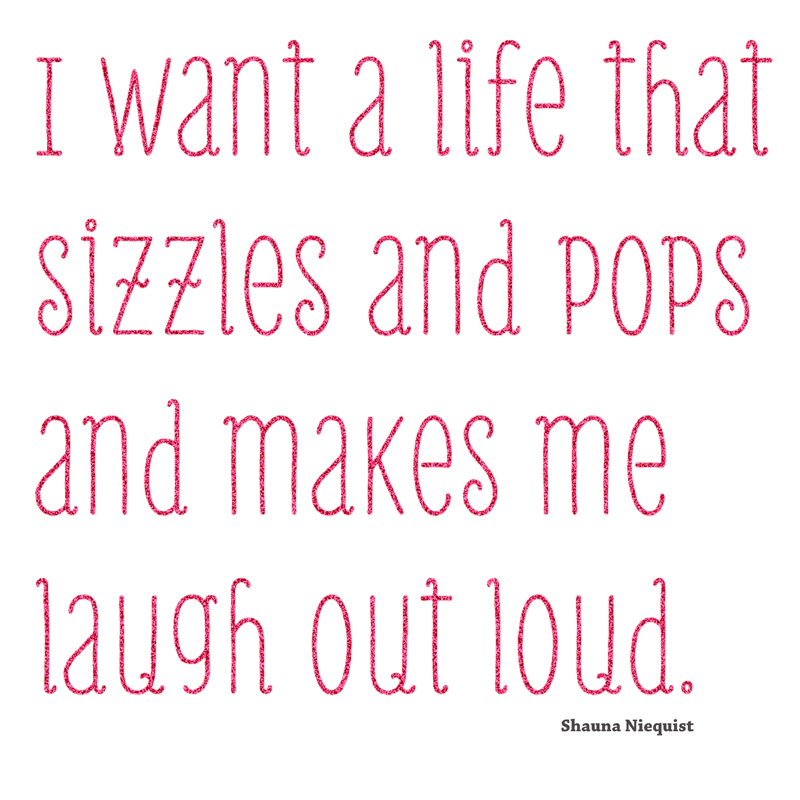 ), great music, much laughter, and maybe even a little dancing! Everyone dressed up in their best twenties attire, too. I wore this dress from Ruche, my grandmother’s pearls, and a glittery headband and flower hair piece. I also carried one of my favorite vintage clutches (metallic gold with a bow on the front) — an amazing garage sale find from my college days. My shoes were even dolled up for the occasion (I added gold glitter to the heels using gel medium). It meant so much to me to be surrounded by the people who mean the most to me, friends and family who share life with me and know where I’ve been and where I hope to go. People who know my heart and my dreams and who encourage me to be the best version of me that I can be. The decorations were amazing, too: beautiful flowers, polka dots, touches of glitter, and lots of sparkling votives. My friends did an amazing job capturing the glitter and glam of the twenties and creating the perfect party atmosphere. It was truly a special evening, and it was the perfect way to begin a new chapter and season of my life. Here’s to new chapters, seasons, and adventures! I can’t wait to see what my 30th year holds. P.S. In the next few weeks, I’ll be sharing a recap of my 29 Things and sharing my new 30 Things list. I have yet to create the perfect homemade latte, but I’ve been trying both hot and iced versions. I recently purchased a latte wand to froth my almond and coconut milk for coffees, and it’s working fairly well. The creaminess of almond and coconut milk seems to be a good choice for non-dairy coffee drinks, although, I don’t care for the fact that on occasion, there are particles in the milk (I guess from the processed almonds). I bought this dark chocolate sea salt caramel sauce to use in this iced latte recipe. This sauce is SO GOOD. You’ve got the richness of the dark chocolate and a hint of caramel saltiness. It didn’t melt as well as I had hoped, but it still added a nice flavor to my coffee. I’ll also be using it on frozen yogurt and coconut milk ice cream this summer for sure. Next up, I’d like to try this iced coffee, flavored with a bit of vanilla and brown sugar. I think the next step of my coffee adventuring will be to find a better coffee pot (possibly a French Press) and try different grounds to settle on my favorite. I think my iced latte above would have been much better with a dark roast coffee (I used a hazelnut light roast). What’s your favorite coffee recipe? Do you make iced coffees in the summertime? Whew! After a hectic couple of weeks, I wanted to stop by to say hello and catch up a bit. So, how’s everyone been? Are you getting a taste of spring in your neck of the woods? Getting lost in a new book (The Aviator’s Wife) If you’re a historical fiction lover like I am, then definitely pick this one up! Well, I’m going to sign off now and snuggle up with the book I just can’t seem to put down. P.S. You may have noticed that I’ve been experimenting with new templates lately…Spring always makes me feel restless. I crave freshness and newness. So, you might continue to notice me tinkering around with things a bit over here until I settle on a look that feels right for this season. The heart of hospitality is about creating space for someone to feel seen and heard and loved. I love that Shauna Niequist’s words do that — that they create a space of warmth and honesty for her reader, a place to feel understood, connected. Shauna’s newest book, Bread & Wine: A Love Letter to Life Around the Table, is another beautifully written collection of stories that are an honest and true reflection of the way God works in our hearts and the ways in which we discover more of who He is and who He created us to be. I read Bread & Wine in much the same way as Cold Tangerines and Bittersweet — cozily curled up with a pen or a pencil, so I could underline and star and make little notes. Reading Shauna’s words makes me want to be braver and more vulnerable in my own writing. Her words inspire courage and a true love for life. And they softly carry grace, too, which is a gift. As I read my way through each story and recipe, I was reminded of my own desires to live with gratitude, to nourish and nurture the community I’ve been blessed with, and to trust — really trust — this story God is writing for me. I want to cultivate a deep sense of gratitude, of groundedness, of enough, even while I’m longing for more. The longing and the gratitude, both. I’m practicing believing that God knows more than I know, that He sees what I can’t, that He’s weaving a future I can’t even imagine from where I sit this morning. I read those words, and with a sigh, thought, yes, exactly. How wonderful it is when an author pens the very words our own hearts could have written, the very words our own hearts need to read. And then there are the recipes. I’m already excited to bless my women’s group with Shauna’s Breakfast Cookies, when we gather on a Saturday morning soon with our coffee, hot chocolate, and open hearts. And I’m making plans for some of the others, as well. I can see myself making the Blueberry Crisp, as I finally welcome spring — a sweet taste of the summer to come. I’m sure the Breakfast Quinoa will become a staple (both for breakfast and dinner), and I’m quite looking forward to adding a few goat cheese crumbles to the pan the next time I whip up a batch of scrambled eggs. I’m also certain this will be a book I read again and again — just like Shauna’s other books. A book that’s scribbled in and underlined and well-loved — the very best kind of book, if you ask me. Bread & Wine goes on sale April 9, but you can pre-order your copy, here. P.S. If you read Bread & Wine, I’d love to hear what you think (and what you cook!). Shauna Niequist is the author of Cold Tangerines and Bittersweet, and Bread & Wine. Shauna grew up in Barrington, Illinois, and then studied English and French Literature at Westmont College in Santa Barbara. She is married to Aaron, who is a pianist and songwriter. Aaron is a worship leader at Willow Creek and is recording a project called A New Liturgy. Aaron & Shauna live outside Chicago with their sons, Henry and Mac. Shauna writes about the beautiful and broken moments of everyday life—friendship, family, faith, food, marriage, love, babies, books, celebration, heartache, and all the other things that shape us, delight us, and reveal to us the heart of God. This organic soap I stumbled on at Target. Smells so yummy! What sweet joys are brightening up your world lately? I hosted a Pink Party on Saturday with a few sweet friends. We had such a wonderful evening, and I couldn’t wait to share some of the pictures with you all. It was such a joy to decorate, plan the evening’s treats, and celebrate the beauty of friendship. We had a variety of delicious treats to indulge in, including tea and hot cocoa, cake pops, strawberry ice cream pie, and sorbet with dark chocolate nibs on top. YUMMO. My outfit for the night: Pink Radiant lipstick, pink ribbon on my polka-dot collar, and pink skinnies. As I mentioned in my 29 Things list, I’ve wanted to cut some of the processed foods out of my diet. So, last week, I made a few small steps in that direction by trying out some new recipes. Even though it’s only been a week, I’m learning the importance of finding a healthy balance that works for me, my body, and my lifestyle. And it’s been fun and inspiring to challenge myself to find and create recipes that feature fresh foods. For the Blueberry Lemon Oatmeal, I prepared the oatmeal, according to the directions on the box of oats, using unsweetened vanilla Almond milk. As the oatmeal was cooking on the stove, I added a 1/2 teaspoon of vanilla extract and lemon zest to taste. I also added the blueberries, once the oatmeal was almost finished cooking, because I wanted them to be heated through, so they’d be all warm and gooey. :) It was delicious! I also stumbled on the blog The Oatmeal Artist, and I’m looking forward to finding breakfast inspiration there for future oatmeal creations. For the stuffed sweet potato, I adapted this recipe (I used quinoa, kale, and onions in my filling). I’m looking forward to trying a few new recipes this week, as well, such as this zucchini pizza I found over at Eat, Live, Run. I’ve enjoyed sharing a bit about my cooking adventures with you all here, and I hope you’re encouraged and inspired to try some new meals yourself! As I continue to experiment, I’ll be sure to post updates. P.S. You can follow along and/or join me in my recipe-collecting adventure over on Pinterest.